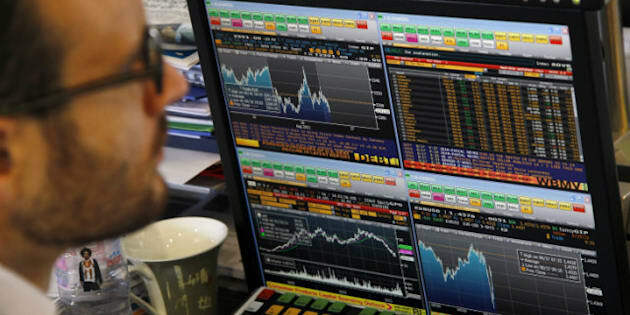 TORONTO - The Toronto stock market closed nearly 400 points lower Thursday amid a global selloff sparked by weak economic reports that spooked already-jittery investors with the spectre of another recession. The S&P/TSX composite index was down 392.9 points at 12,186.71. The Dow Jones industrial average slid 419.63 points to 10,990.58. The S&P 500 index fell 53.24 points to 1,140.65 while the Nasdaq composite index lost 131.05 points to 2,380.43. The loonie slid 0.90 of a cent to 101.17 cents US. The fears sent gold up $28.20 to its latest record close at US1,822 as traders sought to store their money in the perceived safe haven. It had earlier traded as high as US$1,830 per ounce. Copper fell seven cents to US$3.97 a pound. Oil prices stepped back $5.20 to US$82.38 a barrel on reports pointing to possible weaker consumer spending in the United States.